Happy New Year! I hope you had a fantastic Christmas and you're all set for the new year. I've got the feeling that 2014 is going to be a tea-riffic year! So, if you've seen my afternoon tea blog recently you'll know that we ate a lot of scrummy afternoon teas last year. Its tough...but someones got to do it! With lots more teas planned for this year I definitely need to up my exercise levels (which won't be hard as those levels are currently set at zero!!). 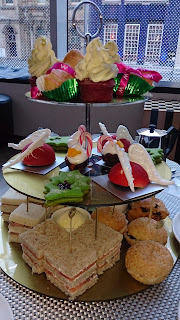 The festive afternoon tea we enjoyed! Luckily we have a fab new year challenge to get me motivated over at Sweet Stampin....this week we'd like to see your projects inspired by sports or fitness! What a great theme for me! Hee, hee....I'm really not sure whether you should use the word "sweat" on a Birthday card! I've coloured my image with my Promarkers and have created my sentiment on my laptop. I've gone with a blue/purple colour combo which I always looks fab together. PS - I have entered my afternoon tea blog in the UK Blog Awards...the public vote is currently open and I'd really appreciate your photo! If you've never seen Tea With Me and Friends you can find it here and if you'd like to vote for me pop by here. Lovely card, Wedgie! 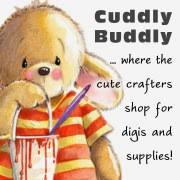 Cute image and fab design. Happy New Year and good luck with the exercise regime!!! Wedgie, I just love this image! I love the colors you chose too. Looking at your blog makes me gain weight I swear haha! Have a happy, healthy New Year. Perfect card for the challenge this week, Wedgie!! I've got to get back to the gym starting Monday as well - back into the running routine! WTG! So stunning.Gorgeous design and i love the fab image. This is super cute! I love the sentiment and image for a birthday card! Thank you so much for playing along at Crafty Sentiments Designs! We hope you play along with us again soon!